FRANKFURT, 15 December 2003 - On view at the Schirn Kunsthalle in Frankfurt until 4 January 2004, this comprehensive exhibitionb is dedicated to the universe of Soviet art in the Stalin Era, which is still only little known in the West. As part of a centralistically organized mass culture, this art relied on advertising mechanisms and strategies for spreading its highly effective propaganda images. 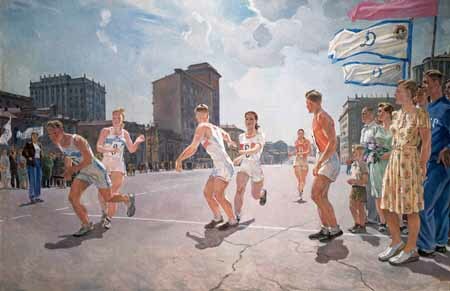 There is an obvious similarity between Stalinist Socialist Realism and the US-American mass culture of that time. The affinity between the Western commercial and the Soviet ideological mass culture is mainly evinced by the fact that both systems advertising schemes were style-formative and addressed all people in the same way  the difference being that a variety of products was promoted in the West, while only one, communism, was promoted in Stalinist Russia with its totalitarian state machinery based on oppression. The more recent works of Sots Art represent a visual comment on the culture of the Stalin Era reflecting the historical events; they critically examine the stalinist regimes aesthetics and mark a distance which separates us from its works both aesthetically and politically. 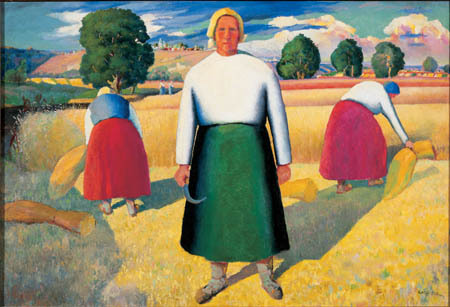 The major survey curated by Boris Groys, professor of philosophy and media theory at the Hochschule für Gestaltung in Karlsruhe, together with Zelfira Tregulova, deputy director of the Kremlin Museums, Moscow, includes works by such artists as Kazimir Malevich, Gustav Klutsis, Aleksander Deineka, and Aleksander Gerasimov, films by Dziga Vertov, Mikhail Chiaureli, and Grigorii Aleksandrov, as well as works by contemporary Sots Art representatives such as Erik Bulatov, Komar & Melamid, Ilya Kabakov, and Boris Mikhailov. The selection suggests an interplay between a range of different media from painting and poster art to sculpture, architectural drawing, and film. Many of the works, which come from collections like the Tretyakov Gallery, the ROSIZO State Museum and Exhibition Centre Archives, the Historical Museum of Moscow, the Russian State Library, and the Central Armed Forces Museum, are accessible to the public for the first time since Stalins death in 1953. The time between World War I and World War II was primarily an epoch that saw fundamental transformations of public space and the formation of a globalized mass culture which would dominate everything. This mass culture was essentially based on media - such as films and posters - allowing the reproduction and distribution of images in large numbers. But the mechanisms of mass distribution also prevailed in the traditional spheres of painting, sculpture, and architecture, which thus acquired a new function and social use. The totalitarian mass movements between WW I and WW II proved to be specifically radical and uncompromising in regard to this all-embracing revolution of traditional culture. The fact that, today, mass culture is primarily considered and analyzed as something commercial and market-conforming should not make us forget that it was, above all, organized and used as propaganda for political purposes in the early stage of its development. The Soviet culture of the Stalin Era not only represents an outstanding example of such a centralistic mass culture but also had the longest lifespan among all known totalitarian structures of its kind. 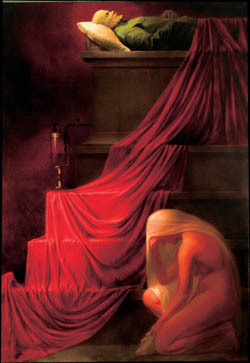 Stalin was the patron, customer, and subject of numerous art works. The realization of his plan of "building Socialism in one country," of a policy of accelerated industrialization and a collectivization of agriculture by force, of the foundation of a modern army and the control of all social classes, for which millions of people had to pay with their lives, was accompanied by a gigantic propaganda machinery. The personality cult around Stalin and the mythologizing of Lenin fuelled a production of images which was to celebrate the regime's projects and achievements. The visual culture of the Stalin era was both a façade and an instrument of power. The exhibition reveals the character of this culture as a multifariously interlocked factory of pictures designed to change the face of an entire empire. Because of its realistic form, this art seemed to be agreeable, unproblematic, and easy to understand for the masses, yet it was a completely ideological venture both in terms of contents and objectives. It does not present itself as a portrayal of life but visualizes the collective dream of a new world and a new man. Unlike Nazi art, which was oriented towards the past, the culture of the Stalin era always remained forward-looking and can by no means be regarded as a simple recourse to the traditions of 19th-century naturalistic painting. The culture of the Stalin era rather built on the Russian avant-garde, which had always striven for an aesthetical and political full-scale transformation of life. Though relying on different artistic and political means, it kept pursuing this goal: the Soviet empire as a work of national art, Socialist Realism as a synthesis of culture and power, Stalin as the ruling artist-despot. This marks the turn from the early avant-garde's "Great Utopia" born in the first years of the century to the twenties' and thirties' new Utopian mass culture that comprises all mankind. Chronologically speaking, Dream Factory Communism starts from this turning point where the major 1992 Schirn exhibition The Great Utopia dedicated to the Russian avant-garde ended. Highlighting Kazimir Malevichs late work and Gustav Klutsis photo collages, the first section of the show documents the road from early avant-garde abstraction to the figurative and photographic solutions of Socialist Realism. The pictures of the "high" Socialist Realism of the 1930s and 1940s and its main protagonists Aleksander Gerasimov, Aleksander Deineka, and Isaak Brodski deal with various aspects of the new Soviet life such as the Soviet leaders embodying "the new Communist man," life in the city, collectivized agriculture, sports, and happy private life. 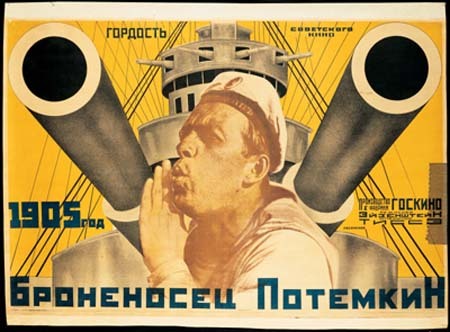 Films from the Stalin era by Dziga Vertov, Mikhail Chiaureli, Abram Room, a.o., which were also seen by many people and are extremely characteristic of their time, will round off the panorama, emphasizing the cross-media character of Soviet art once again. The presentation concludes with Sots Art and Moscow Conceptualism, the unofficial Russian art of the 1960s and 1970s, introducing Erik Bulatov, Komar & Melamid, Ilya Kabakov, Boris Mikhailov, and other representatives. This part of the exhibition exemplifies a genuinely aesthetical criticism of Stalinist Socialist Realism: reflecting the avant-garde Stalinist Utopia and its self-destruction, this approach, in its fundamental rejection of Utopian thinking, relates to Western post-modernism. For those unable to see the show, a catalogue is available: Dream Factory Communism. The Visual Culture of the Stalin Era. Edited by Boris Groys and Max Hollein. With a preface by Max Hollein, an introduction by Boris Groys, and essays by Oksana Bulgakova, Ekaterina Degot, Boris Groys, Hans Günther, Annette Michelson, Alexander Morosow, and Martina Weinhart, as well as interviews with Ilya Kabakov and Georg Baselitz conducted by Boris Groys, German/English, ca. 300 pages, ISBN 3-7757-1328-X, Hatje Cantz Verlag, Ostfildern. If you value our reviews, please tell a friend or join our mailing list!